The Congressional Staff Program on Asia is a bipartisan educational certificate program that aims to equip Congressional staffers with greater knowledge of U.S.-Asia policy in order to better understand America’s role in and engagement with this dynamic region and the policy implications that will directly engage Congress. This program is administered by the East-West Center in Washington with support from Sasakawa USA. CSPA is a bipartisan educational certificate program that provides Capitol Hill staff members with an opportunity to engage leading experts and officials on a range of contemporary, policy-relevant topics in U.S.-Asia relations, while expanding their network of congressional colleagues who are engaged in similar issues. Please visit the East-West Center website for more details. Applications are currently closed. The program consists of a weekly series of luncheon talks on Capitol Hill in winter 2019. Speakers are from universities, think tanks, government agencies, and other policy relevant institutions. Session topics cover issues with implications for Congressional consideration and action, and include: Managing the U.S.-Japan Alliance; Great Power Competition with China; Alliances and Force Posture in the Indo-Pacific; Korean Peninsula Issues; South China Sea, ASEAN, and Southeast Asia; Trade and Investment Competition in the Indo-Pacific; Democracy and Human Rights in U.S.-Indo-Pacific Relations; and U.S.-India and Indo-Pacific relations. Applicants must be current congressional staff, employed by either a member of congress or a congressional committee, and can come from either chamber or party. No previous Indo-Pacific expertise is required, but a strong interest and/or responsibility is highly-encouraged. Preference is given to professional staff from committees and subcommittees with jurisdiction and oversight on issues U.S.-Indo-Pacific relations (e.g. : Foreign Affairs/Foreign Relations, Intelligence, Ways and Means, Finance etc. ); as well as legislative assistants, directors, chiefs of staff, and deputy chiefs of staff serving Members on these committees or constituencies with strong Indo-Pacific interests. • Fall 2017: A group of fifteen participants was selected for the 2017 class of CSPA, held in October and November of 2017. Selected from a competitive application process, participants represented both chambers and political parties, and staff detailed to committees as well as Congressional offices. • Summer 2017: A group of fifteen participants was selected for the 2017 class of CSPA, held in June and July of 2017. Selected from a competitive application process, participants represented both chambers and political parties, and staff detailed to committees as well as Congressional offices. Read about the 2017 session. • Fall 2016: A group of eight participants was selected for the inaugural 2016 class of CSPA, held in September and October of 2016. Read about the inaugural class of participants or read a recap after the first session of classes concluded. This program is a project of the East-West Center in Washington, with financial support from Sasakawa USA. Established by the U.S. Congress in 1960, the East-West Center is a public diplomacy institution that promotes better relations and understanding among the people and nations of the United States, Asia, and the Pacific through cooperative study, research, and dialogue. The Center’s Washington DC office focuses on preparing the United States for an era of growing Asia Pacific prominence. 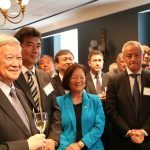 Sasakawa USA is an independent American non-profit, non-partisan institution devoted to research, analysis and better understanding of the U.S.-Japan relationship. Sasakawa USA is dedicated to strengthening U.S.-Japan relations through education, programs, and research.